Seriously, it’s really realistically real. Bio Inc. puts life and death in your hands (literally! ): you can play on the side of Life as a doctor or on the side of Death as… well, as Death, I guess — just like in real life! If you choose to play the role of a doctor, you race against the clock to understand symptoms, diagnose diseases, and apply treatments — and trust me, these patients are riddled with diseases. You will find yourself trying to get rid of John Smith’s incontinence and Parkinson’s while in the meantime he dies of prostate cancer and high blood pressure — just like in real life! If you choose to play as Death, you merely need to use your points to pump as many diseases into one person as you can, as fast as you can, to ensure no doctor could ever help them. Then, you sit and wait for more points to give them more diseases just to make sure. That’s right, say it with me: just like in real life! The most realistic part of Bio Inc. is the way you gather points, whether you play as a doctor or as Death. You see, all high-level medical scientists know that in each of our body’s systems, there are randomly spawning, giant red blood cells and proteins. What a layman doesn’t understand is that most of life and death is a battle of finding those cells and proteins and clicking on them for just long enough to make it boring (say, three seconds) in order to generate enough points for treatments. This is what many people incorrectly refer to as “Obamacare”. Death always wins in the end. 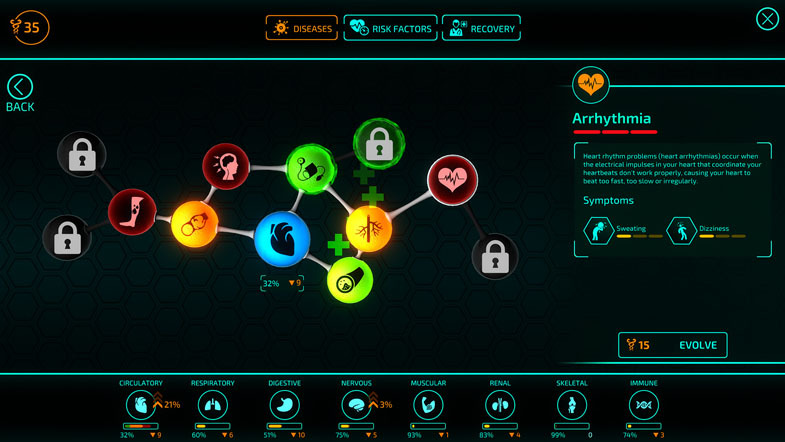 Unless you want to be frustrated, play Bio Inc. as Death, especially in multiplayer. It may get dull just randomly choosing diseases to hand out, but it’s better than the incredibly difficult task of finding those needles in a haystack. Plus, it can be stressful to play as the doctor and watch the nervous system collapse (because everything affects the nervous system), and then watch that collapse destroy all the other systems as you try to treat the minor rash that started it all and your friend playing Death laughs maniacally at the fart sounds when you order stool samples. It’s much better to be the one laughing as realistic gushes of blood spray from the patient’s head (because of course that’s a symptom of severe depression). And you should be laughing, because brutal deaths caused by terrifying cocktails of diseases are funny. Okay, let’s get actually really real here. All sarcasm aside, Bio Inc. is an interesting concept, but the execution just isn’t there. It’s a legitimately fascinating challenge to see if you can diagnose different illnesses against the clock, but the gameplay isn’t balanced at all. The result is the recurring scenario where I say to myself, “Hey, I feel like trying another level of that game,” and then immediately regret the decision once I see the falling bars of the patients’ bodily systems as I wait in vain for clickable cells and proteins to spawn. It’s like a reverse skinner box. Instead of watching gratifying bars go up as I rapidly click on items with a satisfying pop or crunch, the bars eternally plummet toward zero as I slowly click and hold for insufferable lengths of time. And not to harp on the point, but clicking cells and proteins for action points is the least fitting activity possible for this simulator. It isn’t thematic or immersive, it makes no sense, and it’s annoying. I can’t stress enough that this one mechanic really kills an otherwise okay game. The graphics and sound are polished, interesting, and feel like a medical game, even if the gore gives it a dark and strange sense of humor. And I can ignore the fact that people don’t get lupus, two kinds of cancer, heart disease, and swine flu all at the same time, as long as the mechanics are interesting. To control actions, the devs could have had points accrue over time with thematic modifiers like better hospital funding or insurance, they could have let you manage a limited number of medical staff to perform tests and cures, or they could have done anything, anything except make you wait excruciatingly long periods of time to click on pictures for yet more excruciatingly long periods of time. 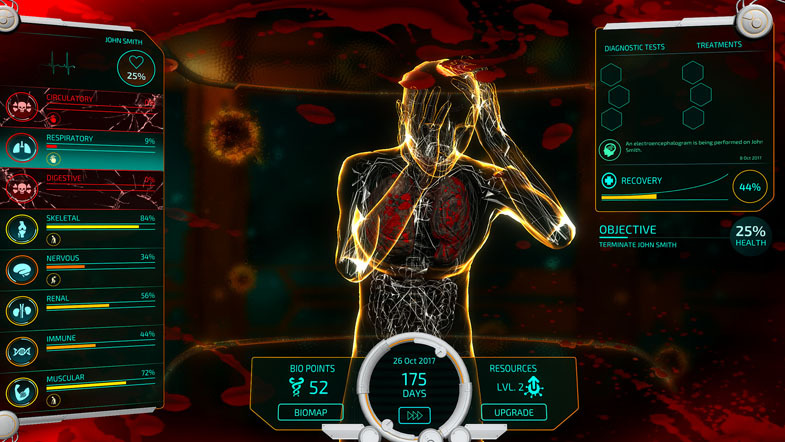 Bio Inc. Redemption presents us with a confused tone: part of it wants to be taken seriously as a realistic medical simulator, while other parts seem to be trying to get a cynical laugh with out-of-place gore and sound effects. Still, this title is well polished and the gameplay is interesting (save for the Achilles’ heel of a terrible point management mechanic that destroys the immersion and fun). Flaws in both balance and theme could have been overlooked if not for the inclusion of this one unfortunate element.